All over the world, human beings create an immense and ever-increasing volume of data, with new kinds of data regularly emerging from science and industry. A new understanding of the value of these data to society has emerged, and with it, a new and leading role for statistics. In order to produce sensible theories and draw accurate conclusions from data, cutting-edge statistical methods are needed. These methods use advanced mathematical ideas combined with modern computational techniques, which require expert knowledge and experience to apply. A degree in Mathematics and Statistics equips you with the requisite skills for developing and implementing these methods, and provides a fascinating combination of deep and mathematically well-grounded method-building and wide-ranging applied work with data. 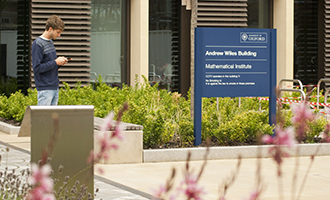 The Department of Statistics at Oxford is an exciting and dynamic place to study, with teaching and research strengths in a wide range of modern areas of statistical science. Many of its academic staff work in the development of fundamental statistical methodology and probability. There is a strong new research group working on statistical machine learning and scalable methods for Big Data. The department’s world-leading team, working on population genetics and evolution, applied new statistical methods to huge genetic data sets to unlock the secrets of human genetic variation and disease. Other groups work on applied probability, network analysis, and medical, actuarial and financial applications. These interests are reflected in the lecture courses available to undergraduates in their third and fourth years. “I find the range of practical applications for statistics really appealing. I heard a talk about the uses of statistics at a Maths open day, and immediately knew that this would be the right course for me. Years 3 and 4: 8–12 lectures and 2–4 classes a week, depending on options taken (courses involving statistical software packages have some lecture hours replaced by teaching sessions in labs). The first year of this course is identical to Mathematics, and the core mathematics part of the degree is completed in the first term of the second year. 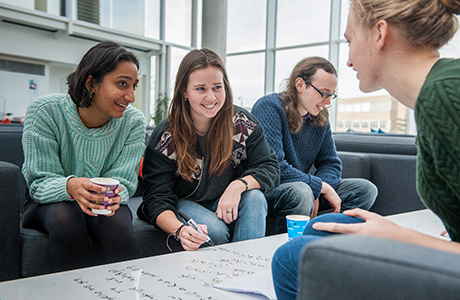 You will also follow second-year Mathematics courses in probability and statistics, and the remainder of the second year allows for some choice of topics in preparation for the greater selectivity of the third and fourth years. In the first two years it is usually straightforward to move between the Mathematics course and the Mathematics and Statistics course, subject to the availability of space on the course and to the consent of your college. There are two Mathematics and Statistics degrees, the three-year BA and the four-year MMath. Decisions regarding continuation to the fourth year do not have to be made until the third year. All third- and fourth-year mathematical topics available in the Mathematics course are also available to Mathematics and Statistics students. The fourth year is naturally more challenging and provides an opportunity for more in-depth study, including a substantial Statistics project. The options listed above are illustrative and may change. A full list of current options is available on the Mathematics and Statistics websites. All candidates must take the Mathematics Admissions Test (MAT) as part of their application. Separate registration for each test is required and it is the responsibility of the candidate to ensure that they are registered for these tests. We strongly recommend making the arrangements in plenty of time before the deadline. Everything you need to know, including guidance on how to prepare, can be found on the MAT page. In recent years, 96% of Mathematics and Statistics graduates were in work or further study six months after graduation. The majority have joined the insurance and financial services professions, but there are a wide range of options for graduates whose studies have included a substantial amount of statistics and applied probability. There is great demand for those wishing to work in the relatively new area of data science, while careers in fields as diverse as health, technology, education and industry are all possible. If you’re buying a computer for university, please do consider a laptop over a desktop, so that you can take the laptop to classes. If you don’t have your own, the department has several spare laptops that you are welcome to use. Why not have a look at the reading lists for prospective applicants on the Mathematics website or in the mathematical sciences prospectus? You can also find out more about the Maths Department's research at the Oxford Mathematics Alphabet.